REGIONAL NEWS - LATIN AMERICA 16 E&MJ • APRIL 2018 www.e-mj.com Newcrest Investing in Lundin Gold, Fruta del Norte Project Newcrest Mining has entered into agree- ments with Lundin Gold to invest $250 million in Lundin to acquire a 27.1% in- terest in the company and, separately, to farm-in to a selection of Lundin's explora- tion concessions in Ecuador. Lundin Gold is building the Fruta del Norte gold mine in southeast Ecua- dor, where the company is targeting first production by the end of 2019. 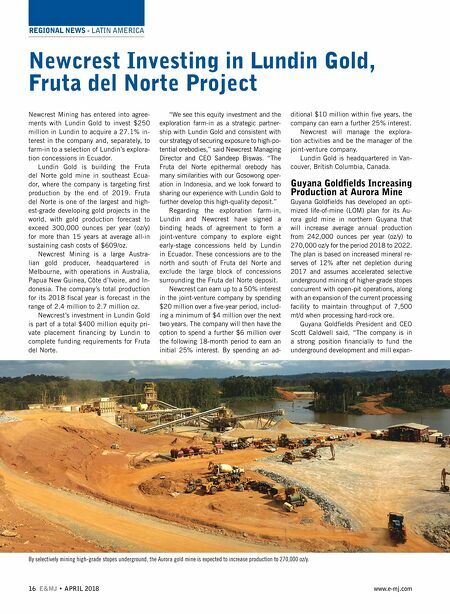 Fruta del Norte is one of the largest and high- est-grade developing gold projects in the world, with gold production forecast to exceed 300,000 ounces per year (oz/y) for more than 15 years at average all-in sustaining cash costs of $609/oz. Newcrest Mining is a large Austra- lian gold producer, headquartered in Melbourne, with operations in Australia, Papua New Guinea, Côte d'Ivoire, and In- donesia. The company's total production for its 2018 fiscal year is forecast in the range of 2.4 million to 2.7 million oz. Newcrest's investment in Lundin Gold is part of a total $400 million equity pri- vate placement financing by Lundin to complete funding requirements for Fruta del Norte. "We see this equity investment and the exploration farm-in as a strategic partner- ship with Lundin Gold and consistent with our strategy of securing exposure to high-po- tential orebodies," said Newcrest Managing Director and CEO Sandeep Biswas. "The Fruta del Norte epithermal orebody has many similarities with our Gosowong oper- ation in Indonesia, and we look forward to sharing our experience with Lundin Gold to further develop this high-quality deposit." Regarding the exploration farm-in, Lundin and Newcrest have signed a binding heads of agreement to form a joint-venture company to explore eight early-stage concessions held by Lundin in Ecuador. These concessions are to the north and south of Fruta del Norte and exclude the large block of concessions surrounding the Fruta del Norte deposit. Newcrest can earn up to a 50% interest in the joint-venture company by spending $20 million over a five-year period, includ- ing a minimum of $4 million over the next two years. The company will then have the option to spend a further $6 million over the following 18-month period to earn an initial 25% interest. 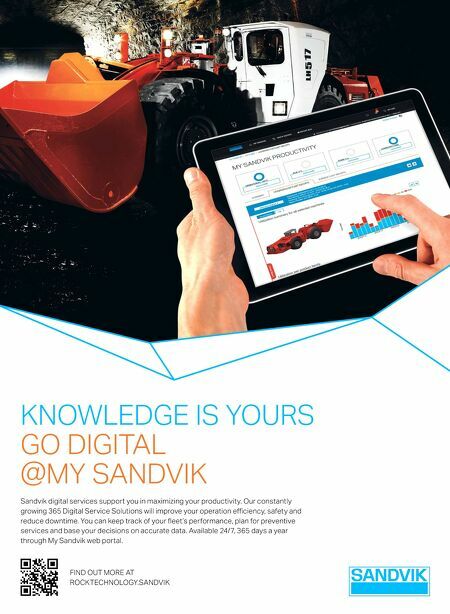 By spending an ad- ditional $10 million within five years, the company can earn a further 25% interest. Newcrest will manage the explora- tion activities and be the manager of the joint-venture company. Lundin Gold is headquartered in Van- couver, British Columbia, Canada. Guyana Goldfields Increasing Production at Aurora Mine Guyana Goldfields has developed an opti- mized life-of-mine (LOM) plan for its Au- rora gold mine in northern Guyana that will increase average annual production from 242,000 ounces per year (oz/y) to 270,000 oz/y for the period 2018 to 2022. The plan is based on increased mineral re- serves of 12% after net depletion during 2017 and assumes accelerated selective underground mining of higher-grade stopes concurrent with open-pit operations, along with an expansion of the current processing facility to maintain throughput of 7,500 mt/d when processing hard-rock ore. Guyana Goldfields President and CEO Scott Caldwell said, "The company is in a strong position financially to fund the underground development and mill expan- By selectively mining high-grade stopes underground, the Aurora gold mine is expected to increase production to 270,000 oz/y.